I am a Canadian Born Chinese (CBC) currently living in Canada. I became fascinated with travelling, especially doing it solo a few years back and have been hooked ever since. You can check out my blog focusing on lifestyle improvements written from a CBC's perspective and also my journey towards location independence at CBC Survival Guide and also snag a copy of my free eBook while your at it! In the last few years, it seems blogging has become some sort of global phenomenon. You always hear people talk about how they are going to start a blog and you wonder what’s so special about blogging? Well, blogging provides many benefits that are not quite apparent until later on when you actually have a blog and start having traffic. Truth be told, I used to think blogging was a waste of time. I thought people who ran blogs had way too much time on their hands. It wasn’t until later on when I started to do some research on sources of passive income that I decided to take the plunge on blogging and now I have never looked back. What’s even better is the great feedback I have received from others who have visited my blogs (I have dabbled in a few different niches) and it motivates me to continue blogging and writing about my journey. I actually nowadays look forward to blogging and have recommended to a few others who are asking me about whether or not they should give it a go. Today, I would like to share with you, my reader’s five reasons why you should start a blog. Make no mistake, if you put a certain amount of time into a craft, you will become better at it in due time. Doesn’t matter what it is. Through experience and feedback, you will be able to make the necessary adjustments to become better over time. With writing, the same applies. I used to be a horrific writer, like just cringe worthy. I couldn’t string a sentence together nor convey my thoughts properly. However, over the years, I have seen much improvements in my writing and with that, I have been able to add some personality and sizzle into my writing. When you have a blog, you can experiment with your writing style as well. You don’t need to adhere to a one size fits all approach, but can instead experiment until you find one particular style that you’re comfortable with and works for you. When you start writing, it forces you to focus your words and thoughts down on a piece of paper or rather on a computer screen. You’re essentially training your brain to become better at focusing on the task at hand instead of wandering all over the place. This will help you think deeper about specific topics and how to convey that topic in writing for yourself and your readers. When you start a blog and write about a particular topic or series of topics, other individuals who also share your passion will stumble upon your blog one way or another. You will develop a following overtime and be able to communicate and network with these other individuals and build a community and friendship that will help you along the way on your blogging journey. When you start blogging and running a blog, you will quickly realize you will need to learn about several different skills such as setting up a blog on a content management platform such as wordpress or tumblr, developing logos using graphic design programs such as Adobe Illustrator, Search engine optimization to rank higher in google if you want to attract more readers, website design, etc. Once you’ve become proficient with the skills mentioned above, it will open up more job opportunities for you. You can now either freelance your skills to others or apply for jobs that require these new skills that you have developed. In addition, you can also monetize your blog and make a little money through advertising or affiliate programs. If you’re an expert in your field and you have a large following you could even create products for your readers. Blogging gives you financial options. If say you were just fired or laid off from your job, well at least now you have another source of income coming in and won’t be stressing out as much compared to only relying on that one job. Starting a blog doesn’t need to be a big complicated process and you don’t need to be some expert in your field in order for people to visit your blog and follow you. The only thing you really need to do is just get started today. 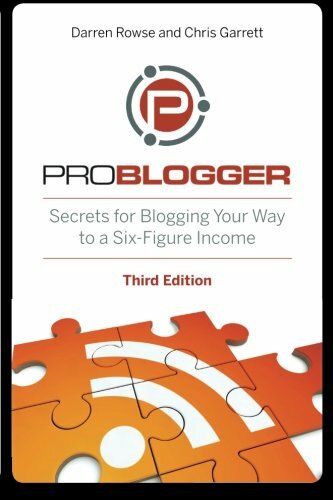 This is a great guide on how to create an income with a blog from one of the web's premier blogging authorities. Thank you! I really think you have a good foundation of thinking regarding blogging. I will have to check out the book!